Hey everyone! Guess what? I actually worked on a yarn project this week! Haha. Last week you may remember that I had lost my crochet hook. Well I found it this weekend and started the border on one of the baby afghans for my best friends twin girls. She is 28 weeks pregnant now, and her shower is not officially on the 24th, so that's the date by which I need to finish the borders. I made the blankets a few months ago when we didn't know what the genders were, so I decided I'd add a border according to gender later. And if they were both the same gender (and they are) I wanted to make them each a little- unique, since they're twins, not two of the same person. So thus far I am only reading two books this week. Shocking I know. As Silver Refined, which is great but meaty so it is one of those things where you read it, then sit it down and meditate on it. Digest. I decided I'm not allowed to start a new book until I finish it. So I have a backlog of five books waiting to be read and reviewed. I also am working on Covenant for a Bible study I am in. They are actually both by Kay Arthur, so I joke to Anne, my friend I'm doing Covenant with, that Kay Arthur's in my headddd. It's good though. And God is sovereign. I'm reading As Silver Refined for a book review, and Covenant is a study we started in the fall and had to pause due to personal things, so the fact I'm reading them at the same time is not by my design, but I don't believe in coincidence, so it's by His. Oh! If you're looking for a book to read, how would like a free one? I announced the winner of my giveaway and when I did, I realized I could offer free books to everyone by linking to people already doing that. So check it out and see if you want one. And these are print books, not ebooks, though I know of a few places to get free ebooks too so maybe I'll do that list another time. 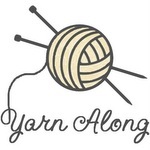 And, my yarn alongy friends, could you do me a favor and vote for me by clicking the link below? The click is the vote, so it'll take just a second, and it'd mean a lot to me! Thanks! So glad to have "met" you through the yarn along.